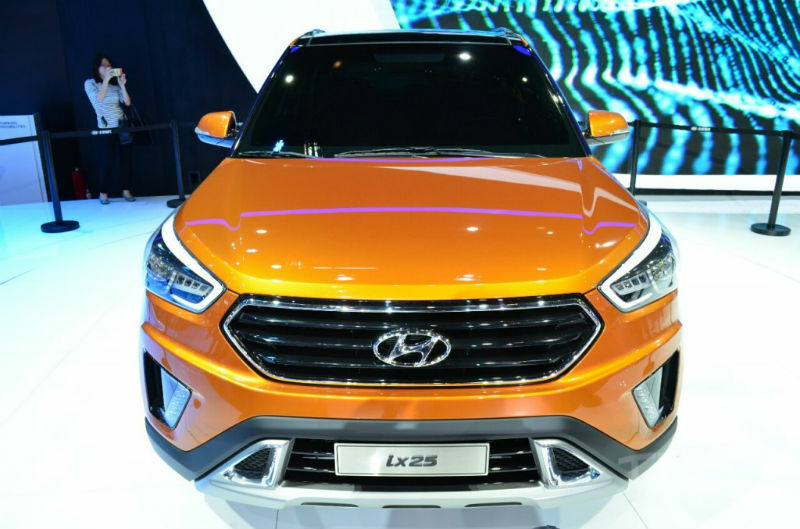 Hyundai ix25, one of the most awaited compact SUVs, finally broke cover and waived hands to the audience at Beijing Auto Show 2014. About to launch in China later this year, we guess this compact SUV will travel to various countries around the world in the coming time. 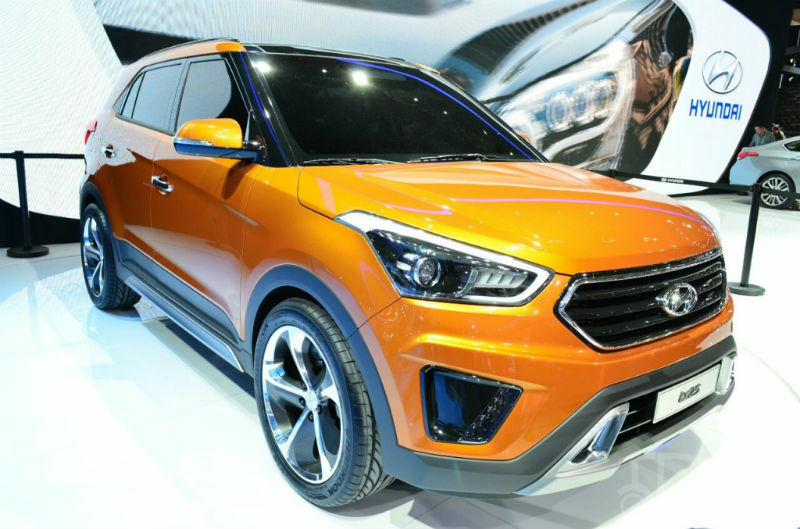 Measuring length at 4,270mm, width at 1,780mm and height at 1,630mm, its wheelbase stretches to 2,590mm, and is subtle enough to cater the buyers in China, flanked cosmetically by Hyundai Motor’s evolved Fluidic Sculpture 2.0 design philosophy. Considering under the hoods, company said ix25 will be embellished with a Nu 2.0 petrol engine. On the aesthetic front, it remains more or less similar to the elder SUV Hyundai Santa Fe. With not so wider front grille, it is done with brushed aluminum finished skid plate on the front bumpers for a stealth kind of persona. The sides are too of compact SUV brace. 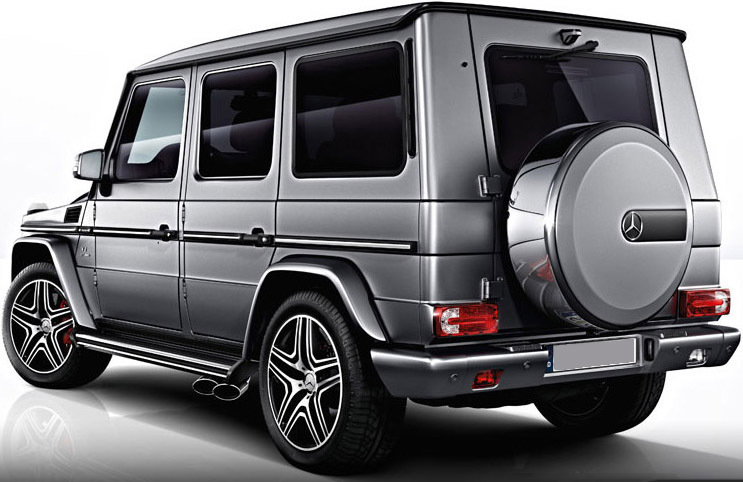 On the rear, it has big tail lamps and king-size exhaust with chrome insert, complemented by a skid plate. The alloys speak of different character. It was disappointing not to see the rear-mounted spare wheel, which most of the compact SUVs of recent times are found having off with great enthusiast. It remains clear, most of the buyers may not appreciate the rear fascia without it as it feels incomplete widely. “The “i” in ix25 stands for the ‘inspiring, intelligent and innovative’ characteristics of the young generation,” said Hyundai. It’s a four-door coupe the like of which has never been seen before in this vehicle segment: the New Midsize Coupe concept car. Volkswagen has brought the concept car to Beijing for its world premiere at Auto China 2014. The ‘New’ part goes without saying: the New Midsize Coupe is as new as a new car can be. ‘Coupe’ is also unambiguous: the New Midsize Coupe is low in height (1422 mm) and very wide (1838 mm), it has short overhangs, low visual centre of gravity, dynamic roofline with markedly swept-back C-pillars, muscular side sections and shoulders, long bonnet and short boot lid. ‘Midsize’ is less obvious. It’s normally the term for a car of the Passat class. 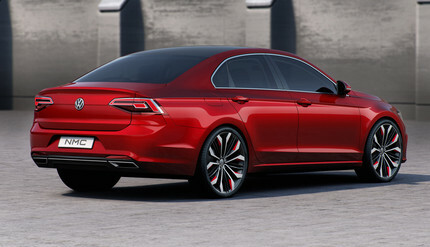 However, the concept car is just 4597 mm long and thus shorter unlike the Passat and shorter even than the Jetta. Nonetheless, as mentioned the concept car outdoes the other two in terms of its width – and it is thus midsized. So clearly this concept car exhibits proportions of an extremely sporty nature. 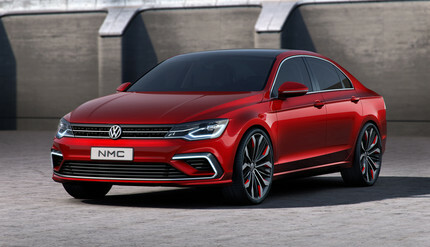 The team led by Klaus Bischoff, Volkswagen head designer integrated these sharp proportions in a body design, which makes the NMC (New Midsize Coupe) an avant-garde and powerful proponent of a new, compact sedan segment. When viewed from the front and rear, it immediately becomes apparent that the designers have placed what is known as the “greenhouse”, a roof section with all windows, on a very muscular body frame. This strongly highlights the large 20-inch wheels and powerfully modulated shoulder sections – that’s a trait of high-class sportscars. The concept car is painted in “Dragon Red” color; this brilliant red special effects paint is part of the total concept, because it emphasizes the powerful modulation of the body especially well. The design team styled the front end to be very progressive. The designers shifted the visual centre of gravity downwards by special styling techniques. This has resulted in greater dynamism. As mentioned, the NMC is distinguished by a very short front overhang and a very long hood. These proportions were enabled by the MQB (Modular Transverse Matrix) by VW, and this innovative technical base opened up new possibilities for designers. The radiator grille structure comprises the Volkswagen badge and three cross fins. The lower cross fin have a polished chrome look towards the front and are brushed aluminum towards the engine, whereas the upper cross fin is painted in high-gloss black. The upper black cross fin makes the Coupe appear even lower in front than it already is, while the bright aluminum/chrome fins highlight its width. The radiator grille forms a stylistic unit together with the also newly designed LED daytime running lights and LED headlights. Under the radiator grille, there’s a horizontally oriented area painted in body color, and underneath this comes the central lower air inlet. On its sides, the air inlet is bordered by two diagonal aerodynamic elements, which run to the outer edges and form smaller air inlets in front of the front wheels, one each on the right and left. The front end is given an unmistakable look by a chrome strip that frames the lower air inlets – its two sections begin on the left and right sides of the painted central area of the bumper, and they run outwards. The designers also styled the side profile in an extremely powerful way. Striking here are the roof line at the top with just two side windows and the fast, Coupe-like C-pillars, which sweep back towards the rear. Another sportscar trait is the passenger cabin, which is set far back; this emphasizes the proportionately short boot lid and the long bonnet. In the meantime, the lower of two levels begins at the front of the car as a very narrow line, which symbolizes the upper limit of what is known as the tornado line. Positioned on what is known as the character line are the door handles, which also adopt the extremely precise modulation. This integration of the door handles is extremely complex; it’s a masterful achievement of production technology, and this symbolizes a distinctive selling point of VW. On the lower side body, there is another line, and beneath it the striking design of the side sill that is finished entirely in metal. The outer wheel surfaces include segments painted in “Dragon Red” body color, whereas the inner surfaces of the machine-polished wheels are painted black. Like the sides and front of the car, the rear body merges the forms of a Coupe with those of a sedan. The crisp design of bootlid features a rear spoiler, which is uniformly integrated into the design and terminates with a unique dual edge. 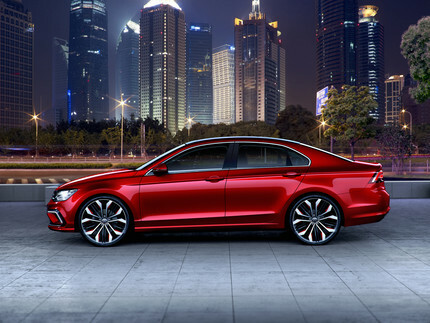 On the next level, there’s another line in the middle of the bootlid at the height of Volkswagen badge, which extends into the rear lights and highlights the width of the Volkswagen New Midsize Coupe. 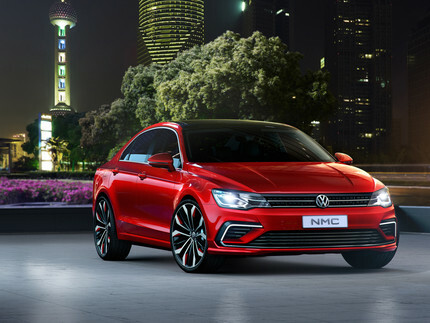 Powering the Volkswagen New Midsize Coupe is a 2.0 liter turbocharged petrol injection TSI powerplant, which is good for churning out 220 PS of power. The engine is mated to a similarly efficient seven-speed dual clutch transmission. 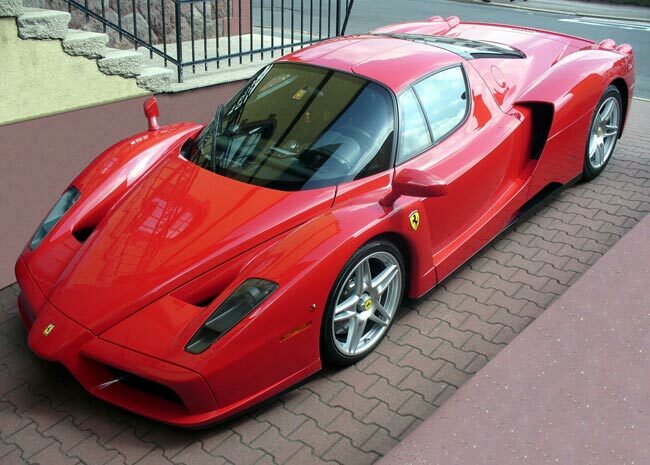 It accelerates from 0 to 100km/h in 6.5 seconds. On a racetrack or German motorways, the concept car would be able to reach a speed of 244 km/h. Driver-focused and equipped with leather sports seats, the interior follows the dynamic concept of a Coupe. However, the Volkswagen New Midsize Coupe is in no way tight or constricted. Instead, it offers comfortable seating for up to five. The inner surfaces of the seats are designed in a bright “Silk” color, whereas the outer areas form a contrast in the dark “Ebony Black”. The inner and outer surfaces are visually separated by elegant piping in “Dragon Red” that’s the body paint color. Advanced interior elements include many components trimmed in Alcantara including the roof pillars and roof lining and trim strips in piano finish look. The controls, including the infotainment system and multifunction sports steering column, are based on Modular Transverse Matrix A (MQB-A) and have thus been adapted from the current Golf. Over and above this, the automaker is demonstrating with this concept Coupe just how multifaceted the Modular Transverse Matrix is and what exciting models VW customers all over the world can look forward to over the next few years. Special editions have proven themselves a great way for high-end automobile manufacturing companies to get a little bit more for their wares, but they appear to be gradually being taken over by customization programs, which enable customers to order their exotic cars just as they want them. After all, what’s the point in ordering a special color scheme someone else has chosen when you can choose it yourself, with special interior upholstery and wheels to match? Lamborghini introduced their Huracan at the Beijing Auto Show. That wasn’t the only car present at the show; they also showcased their Aventator with Ad Personam work. A roaring success at the Geneva Auto Show, the Lamborghini Huracan made its highly anticipated Asia launch at the Beijing Motor Show. As the heir to the most successful Lamborghini ever, the Gallardo, the Huracan is expected to make waves in the supercar realm, thanks to its unmatched technical innovation, styling and performance. 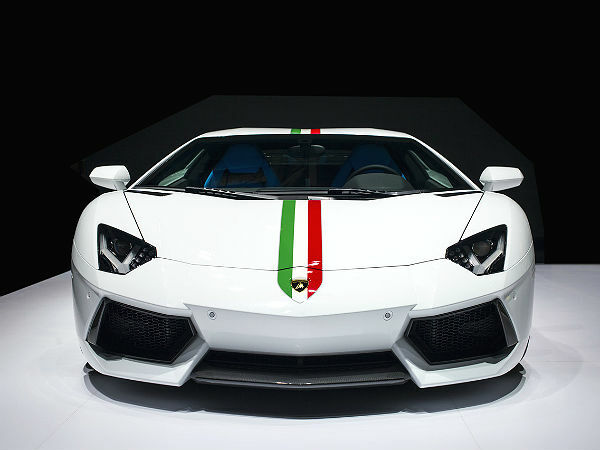 At Beijing Auto Show 2014, Automobili Lamborghini also presented the Aventador in a highly appealing and exclusive configuration known as Nazionale. It was realized by Lamborghini Ad Personam, a customization program, which allows clients to create their own made-to-order Lamborghini. All eyes on the upcoming Beijing Auto Show, so why not turn some of them towards itself. As a result, Lamborghini one off Aventador Jackie Chan Edition is revealed officially before the debut. 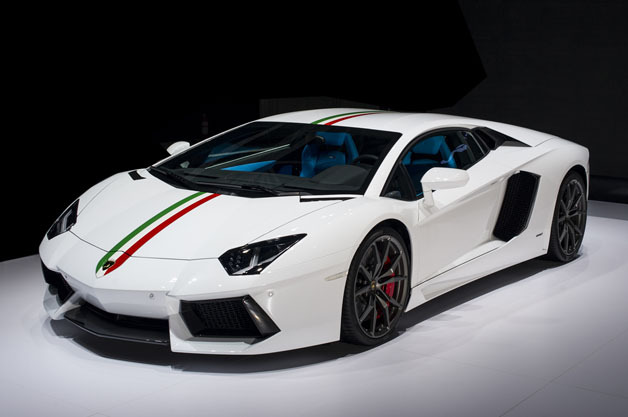 The special Aventador is developed under the hat of Lamborghini’s Ad Personam program. The Italian supercar is don with the titanium grey paint shade on exterior, while shiny Nero Ade alloy wheels completes it. On inside, a red and black theme along with the word “Long” embroidered in the headrests, the source reported; doors as a reference to the actor’s gets embellishment of the Chinese name – Cheng Long. 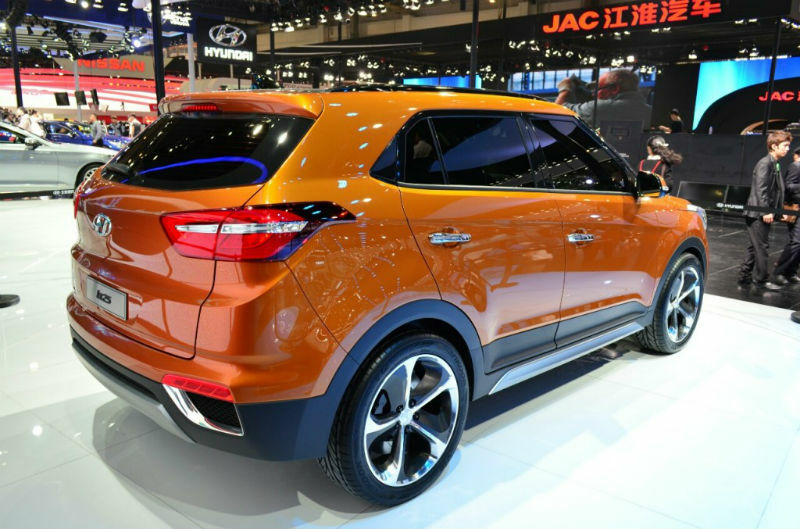 However, the car will be up on sale err auction at the Beijing Auto Show, with the money collected to be funded to the China Film Institute “Jackie Chan Charity Fund” that supports China’s film industry. 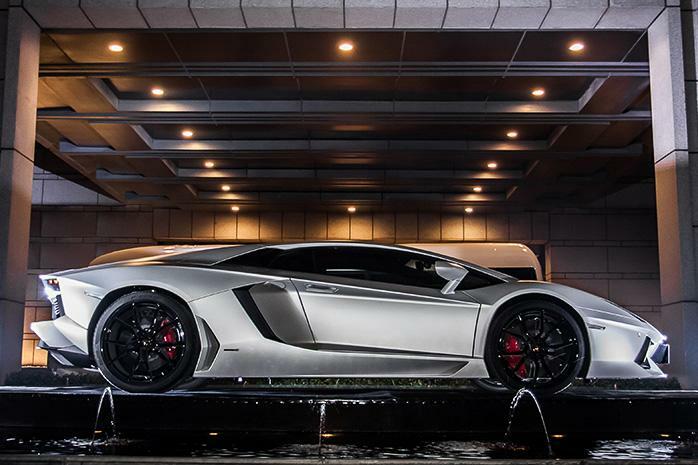 Probably, the price will be worth more than the 7.38M yuan (approx 1.2M USD) – the Aventador’s starting price in China. Only couple of hours ago, we reported that there are good chances of the forthcoming sport utility vehicle from Lamborghini being christened as Urus and not Deimos. 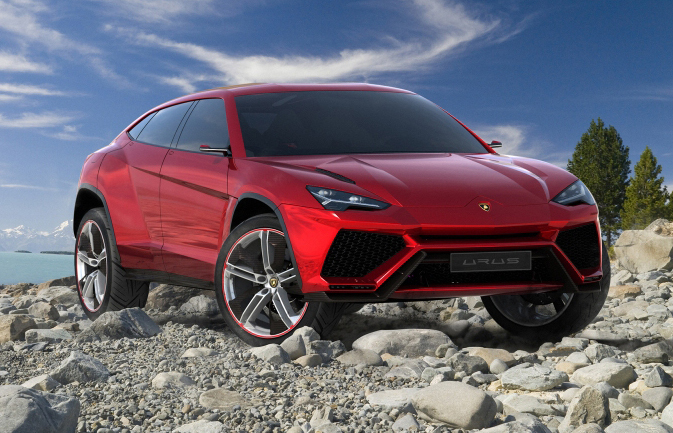 According to the reports, Lamborghini will be introducing this sport utility vehicle at Beijing Motor Show this year. The latest enhancement is that an image of this sport utility vehicle has started doing rounds on the web and our sources say that this is an official image of the forthcoming SUV. The latest that has surfaced is that after looking at a lot of renderings and spy images, at last we have a few official renderings of the vehicle. 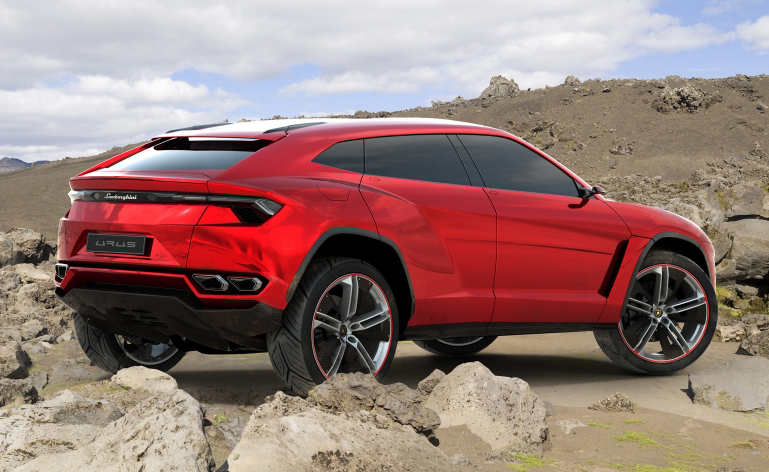 Going by what we can make out from the images, this Lamborghini doesn’t looks as compared to the BMW X6 and the new sport utility vehicle is likely to be 5 meters long and have the power of 600 horses. It will be equipped with an all-wheel drive system that will send power to all the four wheels and is based on the parent Volkswagen’s PL71 platform. The sport utility vehicle looks like a Lamborghini supercar on steroids and that can’t be a bad thing. It will feature outside rearview mirrors with a video camera incorporated in them and LED lamps. The highlight at the back has to be 4 trapezoidal exhaust tips neatly incorporated in bumper diffuser. Internally, the seats have a familiar look and seem to be inspired by those found in Sesto Elemento. Motivation for the all-new sport utility vehicle will come from a massive, brawny 5.2 liter V10 engine, which is good for pulsating 580 horsepower. From recent spy shots and renderings, we can tell that the BMW i8 Spyder will cease to be a prototype and make it into production very soon. From the shorter wheelbase and more realistic bodylines, it may finally appear like something that belongs to today’s roads. Sonny Lim, former senior designer for BMW DesignWorks, revealed some renderings of the i8 Spyder, before it’s unveil at the upcoming Beijing Motor Show. Powering the BMW i8 Spyder is an electric motor, capable of a good 131 hp. Supporting the electric power plant is a 1.5-liter 3-cylinder petrol engine, pumping out 220 hp peak power and 221 lb/ft peak torque torque. The combined hybrid drive gives out as much as 349 hp max power and 405 lb-ft of torque, pulling the i8 Spyder from dead to 100 kmph within 4.9 seconds. It is claimed to reach speeds up to 250 kmph. The driver is allowed to choose from three modes of driving – pure-electric, gasoline or a combi. The 1500 kg car can drive over 30 km on a single charge of the lithium-ion battery pack. On support from the gasoline drive, the i8 Spyder can push as much as 600 km. BMW will be unveiling its new i8 Spyder at the Beijing Motor Show at China International Exhibition Center that will commence from 23 April all the way up to 27 April. 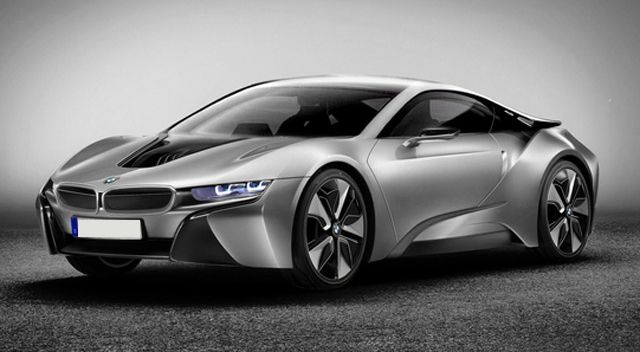 The BMW i-concept first appeared at the 2009 Frankfurt Motor Show and the production model will go on sale from 2014, while the BMW i8 Coupe will go on sale as a 2013 model. The Audi compact crossover segment just gets hotter with the addition of RS badged Q3. The blue RS Q3 shown in the images is the uptuned version of the Q3 compact crossover and is still in its concept form that will make an appearance at the upcoming Beijing Motor Show. Created by Audi Quattro – hence the RS badge – is powered by a 2.5-litre TFSI engine, the same motor that powers the recently launched Audi TT RS. The five-cylinder engine can pump out as much as 360 bhp power, thanks to direct injection and turbocharging. Mated to the petrol motor is Audi’s glorious S-tronic seven-speed dual-clutch transmission, capable of pulling the compact crossover from 0 to 100 kmph in a time of 5.2 seconds. 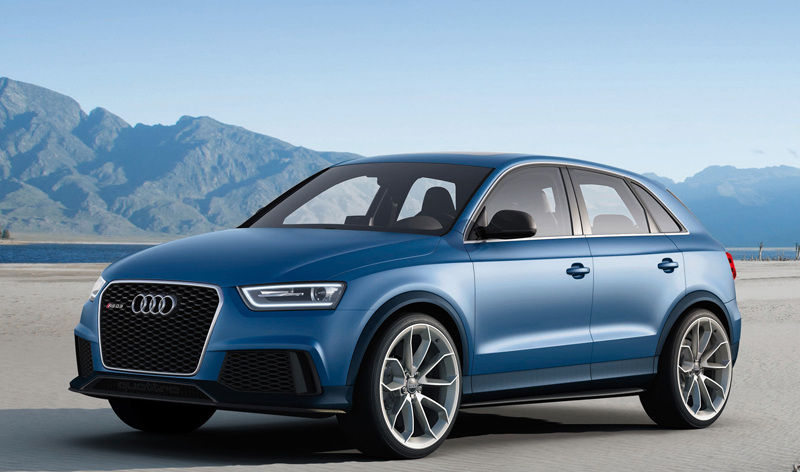 Running on all fours, the RS Q3 can do speeds over 260 kmph. The power is flowing to the front wheels, but incase of loss of traction, a hydraulic multi-plate clutch with electronic control sends the power to the rear wheels. From the images, we can make out the slightly tinted headlights on the front, honeycomb grille, a restyled sweeping bumper and many carbon fibre trim materials, justifying the RS badge. The entire car also rides 25mm lower than the normal Q3, which puts a big question mark to its off-road ability. On the performance end, the RS Q3 sports upgraded brake package, and it now rides on 20-inch alloys. The RS theme follows inside with special two-tone blue and black interior, visible on the seats, steering wheel and the pedals. The steering wheel features big, chunky buttons with carbon finish, and aluminum accents. Ergonomically, the steering wheel is covered with dirt-resistant, black Velvet leather. Other surfaces are covered in blue Alcantara. From the pictures of the concept RS Q3, we can make out that a production variant may be on the roll soon. India is expecting the 2012 Audi Q3 in upcoming weeks, and the RS badge makes it production, we are likely to welcome it. Porsche has unveiled the second generation Cayenne GTS, which it calls as a SUV with the performance of a sports car. 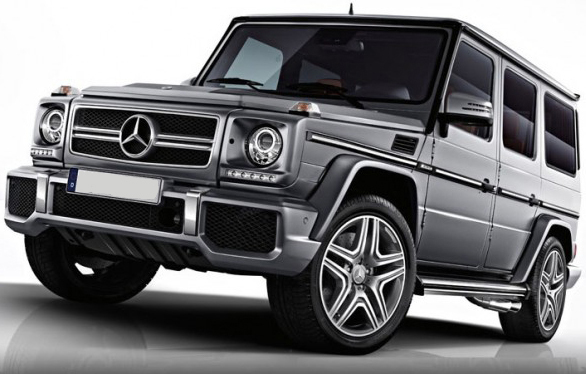 When launched, at the 2012 Beijing Motor Show, the five-door luxury SUV will stand amongst one of the fastest off-road vehicles to be produced. 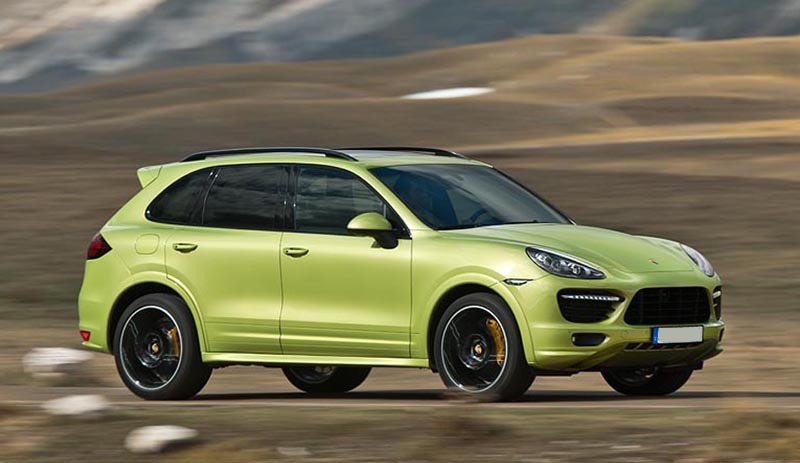 Coming as a 2013 model, the Cayenne carries a GTS badge and is based on the Cayenne S. Under the hood is a 4.8-liter V8 engine borrowed from the Cayenne S, which pumps out as much as 420 hp. This is a staggering 15 hp more than the outgoing model. Mated to the V8 motor is an eight-speed Tiptronic S paddleshift gearbox. In order to handle all the horses, the suspension has been stiffened, chassis dropped by another 20 mm and the lower final-drive ratio is installed. For improved fuel-economy, the Cayenne GTS is featured with stop/start button. 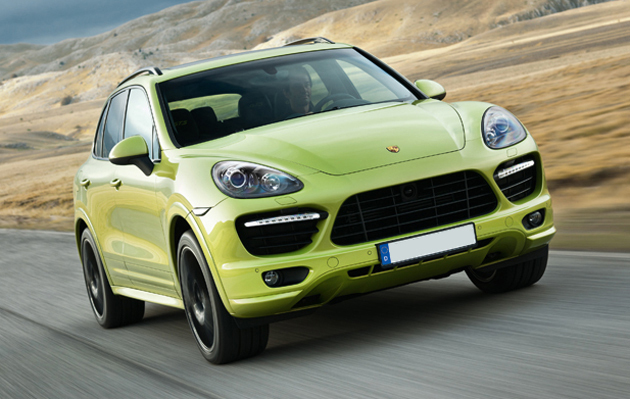 In terms of acceleration, the Cayenne can do 0-100 kmph in 5.7 seconds. Push a little further and it does 200 kmph in 13.3 seconds. The top speed is rated at 260 kmph. Coming with a GTS badge, the new Cayenne features unique side skirts and wheel arches, along with new Peridot Metallic and Carmine Red paintjob. Other GTS-only features include new 20-inch RS Spyder wheels with a unique offset, a sports exhaust system with matte black twin-pipe, alcantara interiors and eight-way adjustable seats. In addition, Porsche offers a Sports Chrono package that allows the driver to monitor the performance. There is also a sound generation system to channel the engine intake noise into the cabin to give a spectacular GTS driving experience. Reaching the local showrooms in July, the Cayenne GTS will be will positioned between the Cayenne S and Cayenne Turbo and fetch $82,050 (Rs 42 lacs). Expect the model to come to Indian shores soon as a right hand drive model is ready.